The Wiremold DQFP20UST by Legrand is a kitchen power pop up with a beautiful stainless steel finish designed to be concealed and flush mounted in countertops. 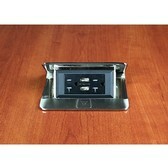 When you push the button 2 power and 2 charging USB pop up, when you are done simply press the top till it latches shut. The power outlets are 20A and tamper proof, the USB charging ports are shared 3.1A. There is a single 6' three prong power cable coming out of the bottom of the pop up that will need to plugged into a GFI protected outlet, or the circuit breaker will need to to GFI protected. The pop up is UL spill water protected and meets and exceeds UL1363 standards, there is also a gasket under the bezel to keep water from entering between the pop up and countertop. To install cut your hole, drop in the pop up, and then secure to the underside of the counter with the included brackets. 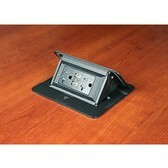 The pop up meets NEC code 406.5E, the outlets are tamper proof so no objects can be inserted into the outlets. It is also spill water protected and meets and exceeds UL1363 standards, this eliminates the risk of shock or short circuiting due to moisture entering device. There is also a gasket under the bezel to keep water from entering between the pop up and countertop. The unit meets UL US and Canadian safety standards for Relocatable Power Taps (File E66421, Guide XBYS) and Mulitoutlet Assemblies (File E15191, Guide PVGT). Bezel dimensions: 5 5/8" x 4 3/4"
Cutout dimensions: 5" x 4 1/8"
Back box dimensions: 4 7/8" x 3 1/2"